Christmas is a very interesting time of year, Because we hear the stories over and over, we repeat the words, and the phrases, which become almost cliches. It’s almost as if you ask a little child what Christmas is, and he will say, “the birthday of Jesus,” and then change the subject to a more vivid interest in Santa Claus. Don’t misunderstand me. I’m not speaking like a Scrooge. I love the Christmas customs and I confess to being really sentimental when it comes to the Christmas tree and the gifts and the carols. I want us today, however, to be realistic about how the legends and customs evolved. What the other thing should mean for us or can do so. How are we follow themes in our practice today? If you look back in antiquity, you go to the Bible and the worship of Yahweh, way back in the early days of the race, primitive man, had his his one source of light and warmth, the sun. And it was the great thing in his life. He worshiped the sun as god, he wasn’t insecure about it because, he didn’t have calendars or clocks or things to remind him of what was going on. Everyday and evening, the sun would fade away and leave. And he had a feeling that something was happening. He was forced to being without the sun without the light without the warmth. He was satisfied when the sun rose again. This happened all the time, so he lived in insecurity. And then came the time, season of the year when the sun began to fade and the days grew shorter and the nights grew longer. A secret fear that the sun would go out forever. You’d imagine the joy when the priest or the witch doctor announced that the day was lengthening and the sun was born again. That change occurred roughly around December 25th. That gives rise to the Festival of Winter Solstice. This winter season. Then came in a natural phenomenon, was no longer deified as gods. One invisible god took place, the place of many visible ones. The many festivals and rights of old origin are still with us and twined into the fabric of modern civilization. If the Romans conquered the world, they brought back to Rome the spoils of wars, along which were the gods of the local people. To be incorporated into the Roman religion, which became the origin of many gods. One of them was Saturn, and they had a festival every year of Saturnalia. The records of Saturnalia are remarkably like the time of Christmas. The festival of Saturnalia is the time where they got of work, and they had family gatherings. Toys and children by Santa Claus with a white beard like figure who came down from the north festival, Saturnalia, the feast of Saturn, about December 17. It seems logic and unlikely that in the early days of Christianity, about the sixth or seventh century, to the time when they set the date for Christmas, it hadn’t been set after that time, it was set by an obscure Roman historian, probably gave the date that seems largely to him because it was the time of Saturn, December 25th. From then on, December 25th was the time of Jesus’ birth, but nobody really knows when he was born. It was also the god of Mithra, which he brought back from him from other lands, the Persian god of light, also was celebrated on December 25th. So, in this way, the Festival of Winter Solstice was suddenly introduced into the Christian faith in the form of festival in honor of the birth of Jesus. Little did we know, that much of the occasion of Christmas and all of the celebrations, has it’s origins, not in the Bible, not in the time of Jesus, in the years that followed, the Saturnalia, Mithra, and various other customs of local people created this legend of Christmas. We trim the tree with lights, it is a remnant of the right, which was the guide the sun, to guide the sun back to life. We eat our plumb puddling, it reflects the ancient festival in honor of the sun, and cakes of corn and fruits were laid on the alter dedicated to the god of light. The most ancient symbol of the sun is a wheel, with spokes and rays. The wheel, interestingly comes from YUUL, meaning sun. A Festival term for Winter Solstice and today we speak of the “yule” log. Probing the background for Christmas traditions we find, first of all, that there are no records telling when Jesus was born. Even the year is uncertain. We set our calendars on the basis of AD Anno Domini, the year of our Lord. 1980, 1990, and 1991. Scholars agree that this is an error in computation. It’s at least five year earlier. So, we’ll all be wrong when we start saying happy New Year in 1991. It’s really 1995. The human creature has always intuitively known the need for transcendent light. Evidenced by the Winter Solstice, through most of the conscious of the earth in it’s early times. This is the time when the sun is at it’s greatest distance from the celestial equator, about December 22nd. Without knowing the actual day of Jesus’ birth. It may have been set, and probably was at this time by design. The symbols of re-infusion of the planet with energy force, transcendent light, bringing vibratory rhythms to lift the earth through peace on earth, good will toward men, sung by heavenly hosts. Not only is the date of birth not known, the story of the birth and the nativity is up to some serious question. It’s agreed by most biblical scholars that the Christmas legends are a result of a few simple facts, blown up in the scenario, born out of conjecture. Over the centuries, they’ve been dramatized and sentimentalized, not that they are fables, but the real meaning is often obscured, and the emphasis on materialism. In the grand charade of gift-giving, and the unbelievable pressures of conformity, obligation, and down-right guilt. Philip Wilder refers to the “Hopped-up pressure-laden, status-seeking competitive degradation to Christmas.” We all know what that is. Every once in a while some traditionally religious people say “Let’s put Christ back into Christmas.” They have slogans bearing this sentiment. Let’s put Christ back into Christmas. Whatever that means. I imagine back in the days of the Romans, they would always say, “Let’s put Saturn back into Saturnalia.” The problem is not that Christmas is ever materialistic, but people abandon the spiritual ideas of the holy day for superficial involvement that becomes a holiday. The holiday is the thing that we see most of. You see very little of the holy day. There’s a few inconsistencies in Christmas legends in passing that make analytic study of Christmas difficult. Two versions of the nativity. The one found in the gospel of Luke, and the other in the gospel of Matthew. Luke’s gospel tells the story of Joseph and Mary coming to Bethlehem and gave birth to a child and laid him in a manager because there was no room in the inn. The word inn, because we can’t do take a version of the Bible and read into them meanings that have come along later in years, the word inn conjures up an English version of Howard Johnson hotel rooms. The word inn conjures revelries in the bar. The inn that I find in the gospels, in verse two, a khan. K-H-A-N. Khan. A protective enclave, like the fence, or wall, where they put their cattle and their horses and their animals to protect them from the wolves and from passing thieves. There were no rooms in the inn, the people slept on the ground. That scripture itself, which has become traditional, has become misleading. It says there were no rooms for them in the inn. It probably originally said there were no rooms in the inn for them, because there were no rooms. So the innkeeper, who has been classically pilloried as a hard-hearted business man, was probably a very compassionate person who found a cave for them in the hills, to get them out of the storm, found a place for the birth of Jesus. This is an indication of how much of the legend of Christmas has been glamorized overemphasized and over sentimentalized, so it doesn’t make any sense any more. Here’s the Matthew scenario. The wise men, who were also called three kings, three magi, they were sons of astrology. They saw a star in the east and have come to worship the Savior. So, that was in the picture of a star up in the sky leading them all to the place place where Jesus lay. No where in the Scripture does it say that at all. If you saw a star in the east, if you look at it logically, if it’s really east and they saw a star in the east they’d be traveling the other direction away from Jerusalem. I wasn’t an astrological sign, but a Zodiac, which led to Bethlehem. And they brought gifts of gold. He’d seen the star, in the studies and the writings of the astrological findings. Christmas in a lot of legends, about the activity of God moving through the minds and hearts of people. It’s a new season, a new age, and the same process moves in our hearts today. And what’s the point of Christmas as a season of observance then? We have another opportunity for this season in which a transcendent level of people at their zenith. People have a chance to express at the highest level. We all see this. I heard someone on television last night that Christmas is a special time because people start holding the door open for you, or pick up things for you when you drop them in the street. They step back when you get in on the subway. Someone said they doesn’t happen very long. The season really is something that pulls out the best stops like an organ playing. Releases the higher nature of man, at least more than we’ve ever seen. A great idea of what Christmas symbolizes is the rebirth of light into the world, awakening people to the dynamic potential of their self. At the time of the Winter Solstice, that point where the sun is farthest away from the earth, and more darkness then any other time of the year. This could be metaphysical. 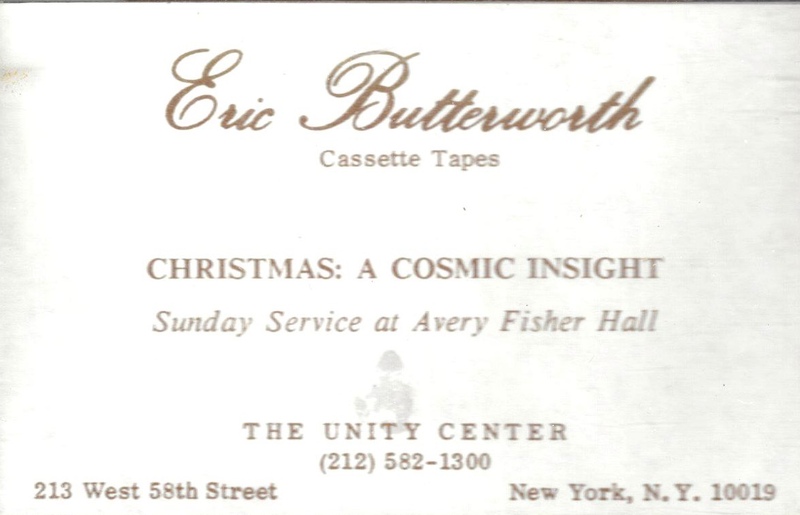 In the time of our greatest darkness, in the midst of our troubles an tribulations, and the threat hangs heavy over our heads, under so much commotion and confusion, and down-right crime and darkness in the cities, at the time when, we open our consciousness, to what becomes a Christ Mass, a celebration, a new light. It’s said that in every person there’s a tiny spark which one may desecrate but never quite loose. In the most criminal of persons, the tiny spark is still the basis of their life. All through their lives, killing the spark as under a bushel. You used to stand up in let your light shine, just a little bit more than before, at least that hidden potential of light, understanding your peace. The question is, can you accept this cosmic insight? Can you believe that on Christmas Eve, there’s a burst of transcendent light on the star up in the skies, and there’s flashing outside somewhere, a releasing of the light from within yourself? Let your light shine said Jesus. For so long, people have been fighting their way through the darkness. Sometimes acting as the lowliest of creatures, but people have always dreamed in their higher moments for their potential for good in themselves and in others. I was reminded of the media play by Peabody which is based on a legend about Saint Francis and the Wolf of Gubbio. And the wolf, who was the central figure in the play, sat on the hilltop overlooking the valley, down the hill of which there was a lighted house, and the family was having their Christmas celebration, a marvelous meal together. The wolf was sighing, and there’s a desire, especially in this beast to become a man. He remembers how to appeal to sit with man and share a meal. In the play is a meeting with Saint Francis, whoever confesses his shame and guilt, together is alone to be a man. And Francis confesses his own horrific sins. The play goes on and this man, there’s a pointed scene in which the wolf grows up saying “I don’t want to be a man, until men stop acting like wolves.” The climax of the play takes place on Christmas Eve. An act of heart-felt contrition that takes place in the ranks of brotherhood. This play, in a symbolic way, gives a rebirth of light. A lifting of the best of nature in people and the awesomeness of the internal divinity. This is what Christmas is all about. Something actually happens in you. Something that expresses through you, not just how you celebrate with outer festivities and ringing jingle bells and singing songs. Something takes place within you, rising up to a higher level of your nature. That’s what Christmas is all about. Otherwise, if we take seriously the celestial spark of light of every person, you realize how it’s truly turning up a bit, like a rheostat, as high as we can. There will be a time when you don’t feel threatened, don’t be fearful, not afraid someone will misuse your light. You let your light shine. During the Christmas season, perhaps you’re able to do that more than any other time. You realize that the meanings such as this, it’s not an end, but a preparation for what is to be done, which comes next. I love the story of a man who told me the meaning of the Quaker meeting house, not having the slightest idea of what Quakers do. And then he sat there with long silence. Nothing was going on, kept looking around, to see, with your eyes closed. No one is getting up speaking. No preaching. No singing. Just sitting. He was puzzled. He couldn’t stand it any longer and he leaned over to a man next to him and said, “When will the service begin?” And I replied, “When the meeting is over.” That’s the spirit of the Quakerism. It’s the heart of the motive, the concept of what Christmas really is. In the same way, true Christmas begins when the day’s celebration is over. When the season is over there is work to be done. A new consciousness to reveal. A new light to shine. Prepare for things to be happening here. People would be better. Places would get along with one another. What about you? What about me? A new consciousness. A new light. Have you heard the expression that we can unfold. A greater focus of light streaming from us. Light is a thing we gonna to be talking about a great deal in the coming year. Something about our center piece, we announced the circle of light program which we’re going to follow through in 1991. We’re gonna introduce this program on January 5th. I hope you’ll join us. Circle of light. It’s a tremendous, important opportunity for us all to be a part of something very great. I don’t think it’s too idealistic. This society that can put man on the moon, send back pictures of Saturn’s rings and Jupiter’s moons, can certainly be ready to experience new steps in the rebirth of light. To actually see the new atmosphere of the planet and new thoughts of transcendent significance. Anyway, I believe we can all do and will do. Who believes the hopes and fears, the deep seated beliefs and mind of mankind as a whole? There’s no other consciousness and [inaudible 00:20:56] collective prototype of the consciousness of man, we can actually forecast the trends of mankind for years to come. Predestination, you say? Nothing of a sort. See the fullness of time, it’s our readiness to receive, not God’s readiness to give. And giving is part of the divine. He’s always there, ready to fill us and fulfill us and we give our acceptance, our readiness. Every year at the Winter Solstice, the season around December 25th, it’s a fullness of time for the world. It’s a divine appointment. But, the question is will we keep the appointment? Is the night dawning? Are we singing? Are we listening? There’s a world of light within us. Are we responding? It’s the humble in us to find that some of the earliest creatures, engaged in this festival of light, Festival of Winter Solstice, engaged in a conscious awareness of the importance of light, and of a desire to fill our hearts with light, we become a creature of the light, we walk in the light. That’s why part of the culture of the race in time immemorial. Since we’ve been having such an elaborate celebration of Christmas, we’ve forgotten about the light that comes from within us. Engaging the light on the inside, sitting in the radiant light of the picture of the store window, a creche or Christmas display. Engaging in the light of the joy of receiving presents and giving gifts is all fine and beautiful. Engaging in the light of a Christmas drama or the sight of the auditorium is fine,... The outer involvement titillating ourselves with feelings of compassion and joy that comes from the outside that we miss the light that come from within. The light is a universal radiant power. There’s no light out there in the world. The world is dark. The light comes from within man. The spirit of the man is the candle of the Lord, says the Bible. You’re the candle of the Lord. You’re the radiant expression of light. Let your light shine. It’s a tremendous idea. Sometime during this Christmas season, today or tomorrow, or next Tuesday, take a moment somewhere, just sit still, close your eyes. Drown out all the jingle bells and the sound of music and the things that have been titillating your senses with gifts to receive and give. Just for a moment. Put it on the outside. Center your attention on the little spark of light within. Which is always present. No matter how you may have desecrated it. Turn up the rheostat. Let the light shine. See yourself as a radiant blurring of light, for blessing of light in your world, in your home, in your relationships, in your office and the world around you, and your concerns about the world peace. Just be an instrument of light for a while. Then you can go back to your Christmas observance. You’ll have more meaning and be more fulfilling and more joyous. But you’ll know that it won’t be over, when Christmas Day is over. It’s not something given to you, it’s something you’re giving, with greater expression. How often when we say Merry Christmas, do we have a merry time. This is not enough. In your heart, you get the sense of the flowing forth of light, festival of light, say to one another, “Happy Christmas of Light.” You’ll feel it in your own consciousness, you might not say it outright, but feel it. The blessing of light, that you give to one person when you see them in their light of consciousness, peace and of love. This is what I call “Practical Christmas-ing.” Practical Christmas-ing. Not observing Christmas, not celebrating Christmas from the outside. Not engaging in a Christmas charade, but a practical Christmas-ing. Letting your light shine in your work, in your relationships throughout all the world. In this consciousness. Merry Christmas of light. Let’s be still for just a moment. Let’s realize a new depth of understanding. Christmas is a challenge. There’s work to be done. A new role to play. Light to express. Christmas is an opportunity to be something more. To all to remember it. We drown in the light. Light flows forth through you. Remember the word, I am, the Sanskrit there is the word I am, I am which means fountain. God is a fountain, not just to sit right outside, but become a transparent eyeball [reference to Emerson’s essay]. Let your light shine through your eyes. We see with light. We see in people and circumstances concepts of light and we call down a blessing. In the hours to come, until Christmas Day, it will be established in the light. Let the light of the Christ spirit shine through us. And if we do, it will be the most beautiful, most wonderful Christmas we’ve ever known. It’ll be the beginning of a year long experience of walking in the light. So be it.